Modern commercial and military communications receivers share the need to reduce noise at the earliest point in the system without introducing intermodulation distortion. Consequently, the importance of a low-noise amplifier (LNA) in a receive system cannot be overstated. Its primary function is to amplify extremely low signals without adding noise to preserve system Signal-to-Noise Ratio (SNR) that allows the receiver to detect these extremely weak signals. Placed as close to the antenna as possible, it is the first amplifier to boost signal strength of a desired signal or signals so its performance will be reflected throughout the receiver. To meet these needs, Fairview Microwave has expanded its portfolio of LNAs to provide this performance over a broad range of frequencies, encompassing all commercial and military communications applications from 1 MHz to 18 GHz. The company has also introduced a line of diode limiters to accompany them. Like all stock products from the company, both the LNAs and limiters are available for same day shipping. While the function of an LNA can be simply stated, optimizing one is challenging as the device must simultaneously deliver high gain, low noise figure, tight input and output matching, and unconditional stability, while also drawing the least current. High gain may be an essential LNA metric, but too much will adversely affect performance of circuits further back in the receiver, so optimum performance is always a trade-off between it and noise figure. In addition to its noise figure and gain, the LNA’s linearity must be very high to minimize harmonic and intermodulation distortion and gain compression, and it is achieved by operating the LNA’s active devices in their linear region. An LNA must also be unconditionally stable to prevent oscillation regardless of the load at its input or output. The active devices used in LNAs range in technology from silicon CMOS to gallium arsenide pseudomorphic high-electron-mobility transistors (GaAs pHEMTs) and bipolar silicon-germanium transistors (SiGe) as they all offer a good combination of performance characteristics. 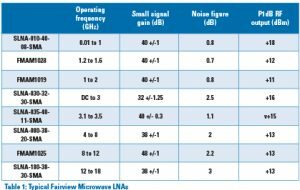 Fairview Microwave’s LNAs include GaAs HEMT-based designs as well as SiGe transistor-based designs as both technologies combine low noise, low power consumption, and high linearity. Fairview Microwave’s LNAs cover all frequency ranges used by wireless systems as well as defense systems up to 18 GHz. One model, the SLNA-030-32-30-SMA, which uses a SiGe bipolar transistor, has a minimum frequency range of 9 kHz and extends to 3 GHz while producing 32 dB of gain +/-1.5 dB with a noise figure of 2.5 dB and a P1dB RF output of 16 dBm. Spurious signal rejection is -60 dBc, reverse isolation is 65 dB, and operating temperature range is -40° C to +85° C. Noise figure in the portfolio is as low as 0.8 dB, gain is as high as 50 dB, and P1dB RF output ranges up to +18 dBm. All models use female SMA RF connectors, operate from a single +12 VDC supply, and include voltage regulation, bias sequencing, and reverse bias protection. The LNAs are also quite small, typically 1.5 x 0.85 0.375”. A representative sampling of Fairview’s models is shown in Table 1. Notes: All LNAs operate from +12 VDC, have an operating temperature range of -40 to +85° C, use female SMA input and output connectors, are unconditionally stable, and include integrated voltage regulation, bias sequencing, and reverse bias protection. While receivers must be able to accommodate a broad range of signal levels including very weak ones, strong signals within the receiver’s frequency range are a potential source of damage for the small-signal devices in the LNA as well as other components in the receive chain. Consequently, diode limiters are frequently used to block signals with high signal levels while simultaneously allowing the receiver to act on weak ones. They are universally used in radar and electronic warfare systems in which extremely high RF power levels from the transmitter are present. To support its LNAs as well as provide solutions for test and measurement and other applications, Fairview has introduced limiters that cover a broad frequency range from 500 MHz to 40 GHz with many models covering very wide frequency ranges such as 500 MHz to 18 GHz. A key performance parameter for any limiter is leakage, more specifically the maximum output from the diode (spike leakage) and the power from the diode after it has changed to its low impedance (flat leakage). This metric is important because the power that passes through the limiter during the output spike must be small enough to ensure that damage to succeeding receiver stages does not occur. The leakage characteristics of Fairview’s new limiters are very low, typically +16 dBm and generally less. For radar systems in particular, diode limiters must have very fast recovery times because when the limiters are acting to block a signal the receiver is desensitized, rendering it less effective. To solve this problem, Fairview’s limiters have recovery times as fast as 10 ns, making them an excellent choice for radar applications. The limiters are also designed to provide very low in-band insertion loss to reduce noise figure, which is typically less than 2 dB in most models. The portfolio also includes models with the ability to handle high RF power levels up to 200 W (1 µs pulse, 0.1% duty cycle), another attribute that makes them well suited for use in radar, electronic warfare, and other applications in which potentially damaging signals are likely. Specifications for selected models in the lineup are shown in Table 2. It’s arguable that LNAs and diode limiters are some of the most critical components in a receiver because to a large extent they determine the performance of the stages behind them as well as the overall capabilities of the entire receiver. 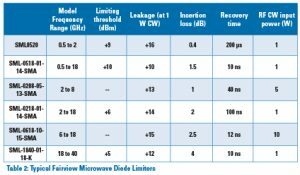 The new LNAs and limiters from Fairview Microwave are designed to ensure that receivers can achieve their stated goals regardless of the wide-ranging signal conditions to which they are exposed. In addition to their overall high performance, they are also extremely rugged in order to perform reliably in any operating environment. More information can be obtained at www.fairviewmicrowave.com.